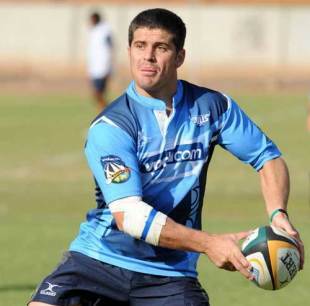 South Africa fly-half Morne Steyn is usually deadly from the tee but his form has a tendency to slump after a couple of missed kicks at the posts. He came to the attention of the international rugby community with his nerveless last-minute penalty for South Africa to defeat the British & Irish Lions in the second Test match at Loftus Versfeld in Pretoria in 2009. Steyn's kick secured a 28-25 win for the Springboks and sealed the Test series in front of his home fans in Pretoria, where he was adored after helping the Bulls to the 2009 Super Rugby title. Steyn set the Super Rugby record for drop-goals when he landed four in one match against the Crusaders in the semi-final, and was a nerveless presence as his side routed the Chiefs in the final. His form won him selection for the South Africa squad to face the touring Lions, and he made his international debut as a replacement during the first Test victory at Kings Park in Durban where he produced a try-saving tackle on Lions wing Ugo Monye. His fly-half rival Ruan Pienaar was handed the Springboks' No.10 shirt for their 2009 Tri-Nations opener but Steyn still made a telling contribution in the win over the All Blacks. As a result he started the second Test and scored all his side's points in a 31-19 victory - a record against their old rivals. He followed up that display with another 24-point haul in their win against Australia in Cape Town. Steyn struggled with his form in the 2011 Super Rugby campaign but kept his place in the Springboks side for the end of season Tri-Nations tournament. However - after a poor performance against the Wallabies, Steyn was told he was playing for his South Africa future in the Boks' second game of the tournament against New Zealand. And that has been the story of Steyn's international career. He oscillates between Man of the Match performances and then costing his side valuable points with erratic kicking a week later. During 2010 he was the Boks' undisputed first choice No.10 and he kept that mantle during the 2011 World Cup but when Heineke Meyer took charge of the Boks then eventually he opted for Johan Goosen at No.10 towards the end of 2012. Steyn continued to shine for the Bulls in Super Rugby but his 10-year association will come to an end in October 2013 after he signed a three-year deal with Top 14 side Stade Francais.